This evening, citizens in the greater La Crosse area will get the chance to ask questions and learn more about two key issues ahead of next Tuesday's state supreme court election: the need for stronger recusal rules in Wisconsin – and the importance of voter turnout in Spring nonpartisan elections. This event is free and open to the public. All of the details for the event are here, on the printable flyer. Because Wisconsin has the 4th weakest judicial recusal rules in the nation. Currently, judges may decide for themselves whether or not to step aside in a case involving a party who gave them a large campaign contribution or spent money on their behalf. This recusal "non standard" has led to serious conflicts of interest on the state's highest court and the erosion of public trust and confidence in the judiciary at all levels in Wisconsin. As a result, it is critical that Wisconsinites understand this issue – and why turning out to vote in judicial elections is vital to the overall health of our democracy. We look forward to seeing you tonight in La Crosse – and please be sure to make your voice heard at your polling place, on or before April 2nd. 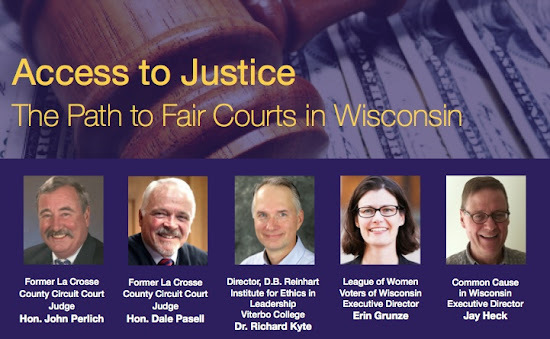 TONIGHT: Town Hall Meeting in La Crosse – Recusal Rules & Voter Turnout in April 2nd WI Supreme Court ElectionTweet this!